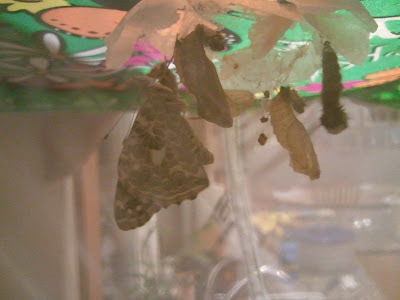 A couple years ago one of the kids got a "Raise your own butterflies" kit for Christmas from a relative. They thought it was the coolest idea ever! So, I took the coupon for ordering the caterpillars from the box and put it on my desk. There it sat for over a year. During the summer I kept telling myself I needed to send it in, then when winter came I told myself it was too cold and I'd wait till spring. Then spring came and I finally sent it in only to be told it was too hot in whatever part of the country the company was based in for the caterpillars to survive transport. So we waited...and finally one day in fall the caterpillars arrived! 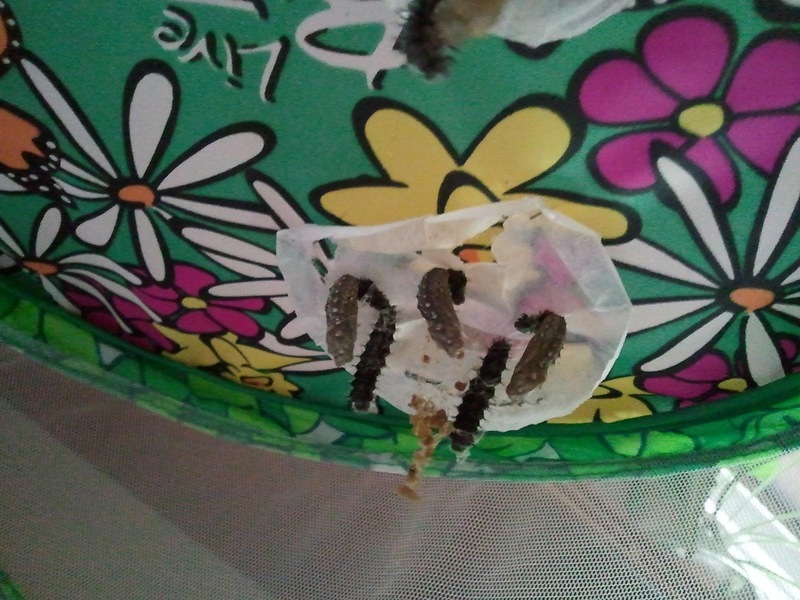 Ten Painted Lady caterpillars came in 2 little cups filled with a caterpillar food/water mixture in the bottom. We kept them on the kitchen counter so we could watch them grow, which they did fairly quickly. Along the way they spun silk all over their little cups around the food and their droppings. 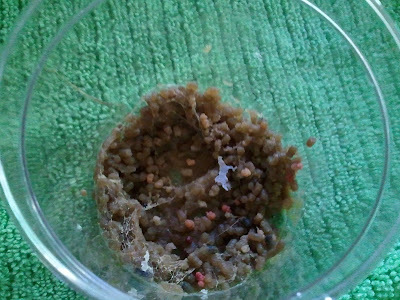 After about a week and a half they were fat little caterpillars that kept crawling to the underside of the cup lid. 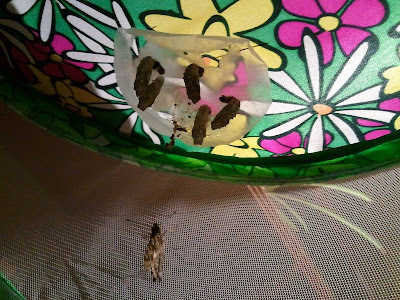 My daughter's class raised butterflies last year, so she was the expert and told us all that when the caterpillars attached themselves to the lid in a J shape they were ready to spin their chrysalis. At this point I was instructed by said expert to move the caterpillars to the butterfly tent. This was no easy feat. Under the lid of the caterpillar cup was a sheet of tissue paper onto which the caterpillars had attached themselves.﻿ Unfortunately this piece of tissue had been shredded and was nearly impossible to attach to the roof of the butterfly tent with straight pins, but I managed to do it! 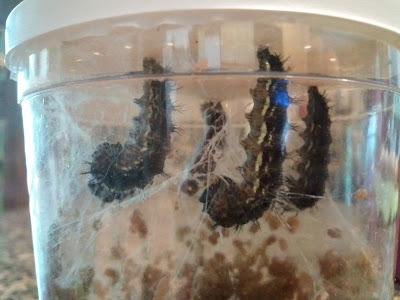 In this picture you can see that 3 of the caterpillars have finished their chrysalis and are a lighter color than the 2 who are still working on theirs. The remains of the caterpillar food/water mixture was probably as much caterpillar poop as food in the end. All but one caterpillar spun a chrysalis around itself. I assume that the one that didn't has now died or will at some point soon. 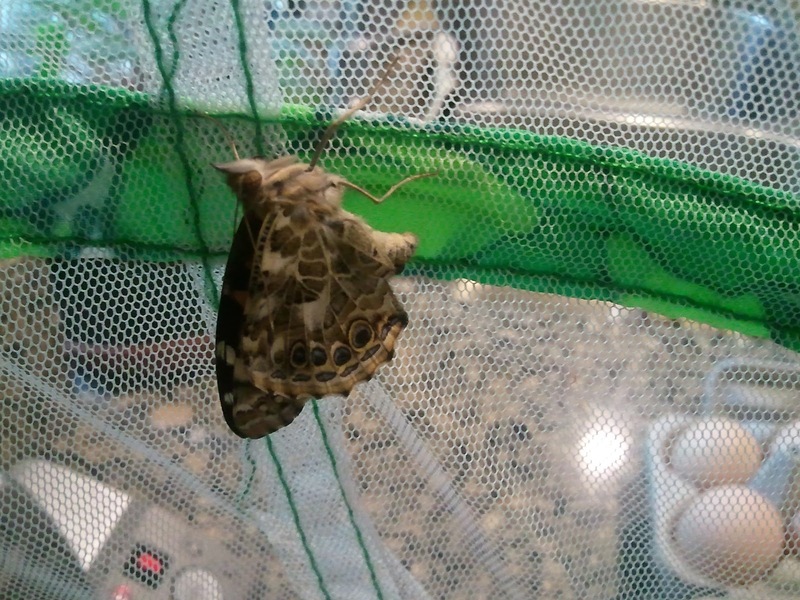 He's still hanging up there with the rest, but has no chrysalis. But that's a 90% transformation rate from caterpillar to butterfly. Not too bad! 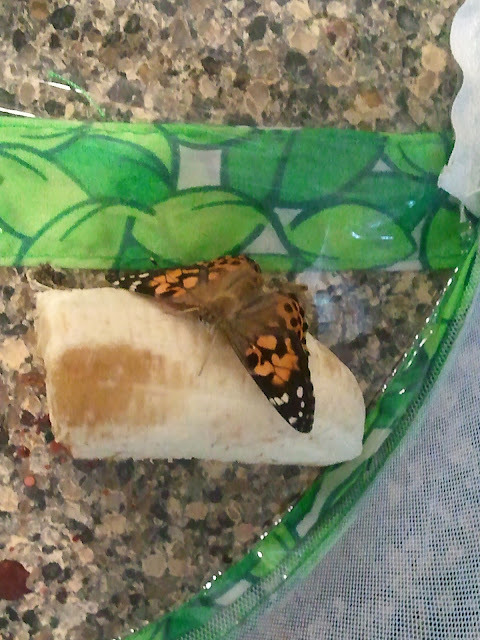 Yesterday after we got home from a hike with some friends I happened to notice that one of our caterpillars had hatched into a butterfly! The butterfly was just hanging on the outside of the empty chrysalis letting its wings dry according to our resident expert. And not more than an hour later I noticed that another one had freed itself as well. I stood there waiting for a long time trying to capture another one emerging but the others are taking their time. This morning 2 more had emerged. 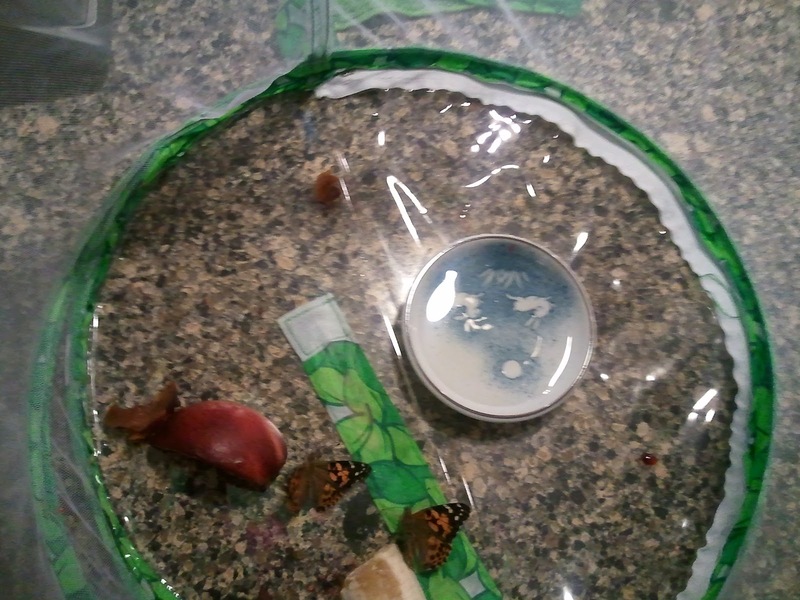 So now we have 4 butterflies fluttering around in there. I've put some sugar water and fruit in the bottom for them to eat. Hopefully they like banana and nectarine! You can see in the picture above that the empty chrysalis is almost colorless. So all of the color of the others comes completely from the transforming butterfly inside. After they all hatch we'll release them into our backyard. The company assured us on their info sheet that Painted Lady butterflies are native to all 50 states; so hopefully they'll be happy in our yard and will go lay some eggs that might hatch next spring.